Limestone Stables is very proud of it's breeding facility and services. Francis Groenewegen, AI technician here at Limestone, ultrasounds and artificially inseminates our mares using the best sires from around the world. Atlantic is a full brother to Ian Millar's In Style. 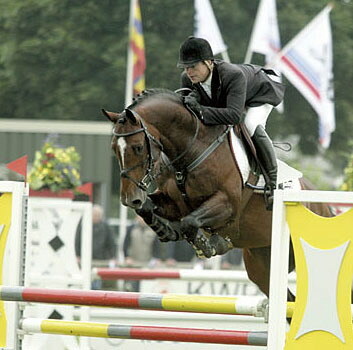 At the age of 6, Atlantic won several important titles: Friesland Champion at Z level jumping, Dutch Champion Z level jumping and Champion of the Bundeschampionat for 6 year old jumping horses. At the age of 7, he became Reserve Champion at Z level jumping in the Levade. 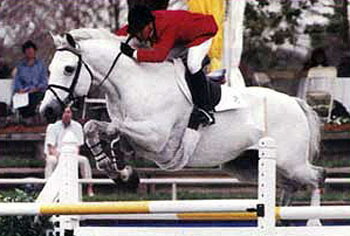 Atlantic also won and placed many times in international 1.40 classes. Now Atlantic jumps at the highest level and placed in the following Grand Prix: 6th in Drammen, 6th in Eindhoven, 2nd in Villach, 6th in Alençon, 2nd in Gera and 2nd in the Sires of the World in Lanaken, 5th in Bordeaux, 7th in World Cup in Vigo, 7th in Manheim, 7th in Cervia and 7th in Maastricht. Atlantic’s offspring have the same quality, they jump with ease and lots of scope. His son Val d’Isere is approved by the KWPN. Another son of Atlantic, Vegas, was selected for the stallion test and placed 5th in the Championship ring for jumping stallions. Harley’s sire line has produced three international jump horses in a row. This line has already sired horses like; Toulon, Caya and Countess G. Harley’s dam, Larthago, won with M. van Asten at several 1.40 and 1.50 classes. Larthago is also mother of Cevin Z, who jumps in 1.50 classes and who is approved by the Studbook Zangersheide. A half sister of Harley’s dam has produced Caritano Z, who was the highest priced horse at the Fences auction and who is approved by studbook Zangersheide. Harley is one of the better stallions of his year. He finished 7th in the Dutch Championship of the 4 year old horses and he is now performing very steady in the stallion competition where he receives excellent comments from the judges. 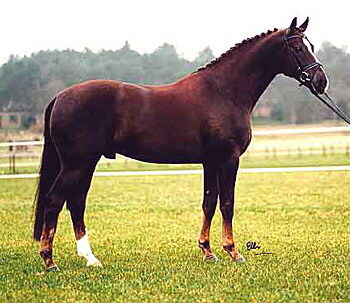 In 2006, he was Champion of the approved NRPS stallions. His first foals were champions; Miss Harley became Dutch Champion of the NRPS Studbook and Dellaya became Reserve Champion of the NRPS studbook. The foal inspectors of the KWPN studbook made a promising foal report. Harley is an interesting stallion who comes out of a super performing dam. Flemmingh sires beautiful, big, long-lined horses with three perfect gaits. This is proven by the great number of Ster and Keur mares, champion foals and dressage performance horses. Flemmingh mares prove themselves in breeding. 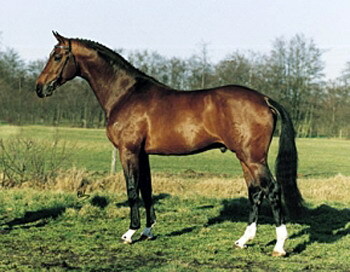 The approved stallions Krack C, Santino and Lingh are some of the most famous Flemmingh sons. His offspring are performing very well at the National and International dressage shows. 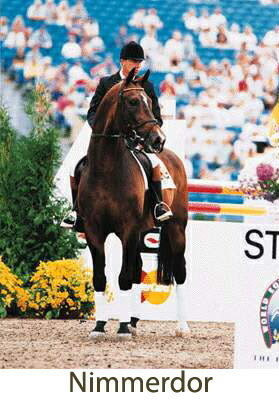 His son Lingh, ridden by Edward Gal, won several Grand Prix and was Reserve Champion at the World Cup Final in Las Vegas, where he was the crowd favourite. He won and was placed in several other Grand Prix and World Cup qualifiers. He was also a member of the Dutch team at the European Championship. Corland represents the very best in breeding, a product of truly top sires. His dam's line is one of the best in Holstein: stamm 104 A. 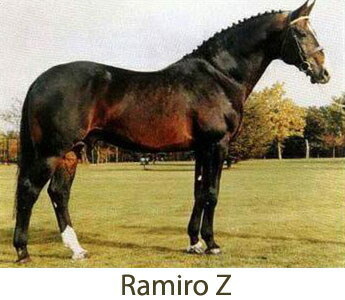 This line starts with Retina, who won the Hamburg Derby twice. Corland's full sister BB Corlanda is an internationally successful show jumper under Willy Mellinger. 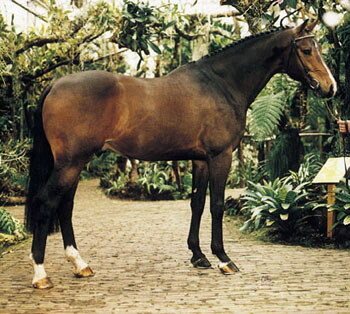 Many of his offspring obtained the 'Sterpredikate', and three of his daughters participated at the NK for 3-year-old mares and obtained top scores in the basic gaits as well as in jumping ability. 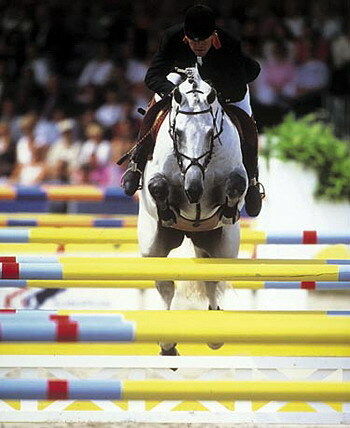 Former USA Olympic show jumping team member with over 20 Grand Prix wins. Competed on numerous Nations Cup Teams and had a top ten finish at the World Cup Finals. Farrington descends from a sound, well bred family. He is one of the few approved stallions with the blood of Doruto in his veins. 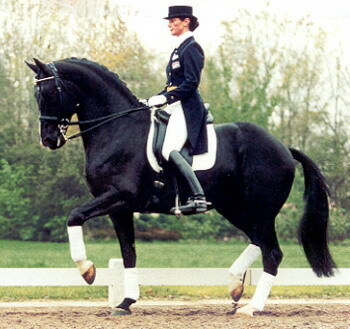 Doruto sired many top dressage horses such as: Olympic Barbria, Chevalier, Ideaal, and more. His sire, Wellington, is also well known as a producer of great movement in his offspring and sired dressage horses like Bollvorms Ceylon and Luxaflex. Due to a fracture in his leg, Farrington was not able to perform in the sport, which is a pity because of the great talent he possesses. During his Stallion Test he obtained an eight for his basic gaits. His daughter, Perry, became Dutch Reserve Champion in the class for 3 year old mares and Theandra became Dutch Reserve Champion of the ‘Keur and Elite’ mares. Farrington’s offspring perform very well in the sport. His son Michigan was the 2005 winner of the Individual Gold Medal at the North American Young Rider Dressage Championships in the USA. Another famous horse who is competing at Grand Prix level is, Limited Edition. Farrington sires horses with a willing character and good basic gaits. These are requirements for top performances in dressage. Good Times is by the legendary Nimmerdor. His dam Zigeunerin (Hols) scored a high 90 in her IBOP. 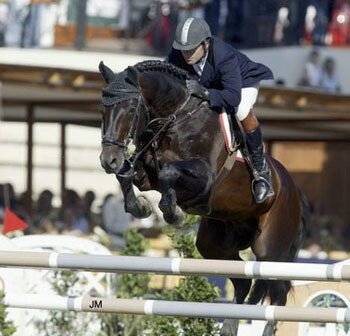 On her sire's side we find Caletto I a full brother to Caletto II ridden by the German team. Good Times was champion colt at the Benelux Championship in Lanaken. He scored 9 for jumping under saddle, cross country, and temperament. * Studbook Zangersheide-a daughter of the famous "FAIRNESS" family.